The NTA product range can assist in learning, understanding, and monitoring what is going on with the most critical parts of an organizations infrastructure. The NTA feature set can help diagnose problems quickly and ensure uptime of customer-facing, web pages or services. This is of critical importance to all businesses in the new sharing economy. The Wasabi Networks NTA products consist of a series of products supporting different network speeds, different storage capacities, and different form factors. The Wasabi Networks NTA products are fully integrated products that are ready to use. The Wasabi Networks NTA products are fully tested hardware and software solutions, working out of the box. The NTA products include all the hardware and software needed for monitoring, analyzing, and testing networks. The Wasabi Networks NTA products use secure HTTP based GUI. For portable NTA products, the GUI runs on the NTA itself. For all NTA products (portable and rack-based) the GUI can be accessed over a secure HTTP network connection from a standard web browser. Easy and intuitive user interface with online help for all functionality. Selected key figures can be displayed at the top of the screen. Most data can be shown as graphs and/or tables and exported as “cvs” (to use with Excel or similar spreadsheet). The Wasabi Networks NTA products come with one year of free hardware and software support. Software updates are easily installed using the built-in GUI. Software updates are typically released four times a year and include new functions and bug fixes. The hardware and software support can be extended after the first year via a service contract. All Wasabi Networks products are able to capture packets from the network being monitored at line speed with a zero packet loss. Zero packet loss is guaranteed for all supported network speeds and for all packet sizes from 64 bytes to 10000 bytes. Packets captured are timestamped with 64-bit nanosecond real time precision. Captured packets can be stored to disks as they are captured. The retention time varies for the different NTA models depending on the disk capacity. Packets are indexed as they are written to disks to enable fast retrieval. Packet filters and slicing can be used to reduce the amount of data to be analyzed and written to disks increasing the retention time. The NTA products provide a wide range of filters that can be used to select packets to captures, filters include; time ranges, Ethernet addresses, VLAN identifiers, MPLS labels, IPv4 and IPv6 addresses, UDP/TCP/SCTP port numbers, and protocol types. Slicing can be used to discard parts of packets that are not needed for analysis of the networks, this could e.g. be used for discarding the part of an HTTPS packet being encrypted. The traffic on monitored networks, like BPS graphs, packet size graphs, and various packet statistics. NTA system information, like disk usage and capture status. Filters can be used to select the captured network data to be analyzed. E.g. Time ranges, Ethernet addresses, VLAN identifiers, MPLS labels, IPv4 and IPv6 addresses, UDP/TCP/SCTP port numbers, protocol types. Automatically identification of packet flows and generation of graphs (and tables) over flows with most packets / bytes / bps and duration. Automatically generated graphs (and tables) over used protocols. Packet and flow analysis with details about timing, protocols, and more. Table and graph data can be exported as “csv” files and imported in Excel or similar spreadsheets. Selection of packets can be exported as “pcap” files or packet data as “csv” files. Flow data can be exported as “csv” files, or flow packets as “pcap” files, or packet data as “csv” files. Packets captured by the NTA can be replayed (transmitted) by the NTA but “pcap” files can also be uploaded to the NTA and replayed. NTA network ports can be used individually (for replay) or grouped together. The same or different packets can be replayed on one or more network ports. A test setup (spanning multiple ports) can be saved as a test session. The NTA supports line-speed transmission of packets on all ports simultaneously. As captured, where the packets are transmitted at the same speed (Inter-Frame Gap IFG) as when captured. With a percentage speed increase or decrease. With a pseudo-random BPS and an average of specified BPS. Infinite, where packets are transmitted until it is manually stopped. Each file to be replayed is transmitted a specified number of times. A specific number of packets are transmitted. A specific number of bytes are transmitted. Packets are transmitted for a specified number of seconds. Wasabi Networks provide a wide range of Network Traffic Analysis (NTA) products. The NTA products support different network speeds, motoring port counts, different storage capacities and different form factors. Wasabi Networks has a huge portfolio of 1 Gbps Ethernet NTA products. Four ports and eight ports versions are available with retention time up to more than 7 days. Wasabi Networks 10 Gbps NTA products are available with retention time of more than one day. Wasabi Networks 1 and 10 Gbps NTA products are available as portable appliances. Wasabi Networks 1 and 10 Gbps NTA products are available as rack mountable appliances. The Wasabi Networks NTA products use an intuitive user interface based on secure HTTP. For portable NTA products the GUI runs on the NTA itself. For all NTA products (portable and rack based) the GUI can be accessed over a secure HTTP network connection from a standard web browser. Online help is available for all functions. The Wasabi Network mission is to make high quality, affordable, and easy to use Network Analysis, Network test, and Network security products. Wasabi Networks headquarter is located in Copenhagen, Denmark. Wasabi Networks was founded by, Jens Christophersen who also was the founder of the world leading Intelligent Network Capture Adapter Company Napatech. FOR IMMEDIATE RELEASE: 8/15/2017 Wasabi Networks Introduces new 2 port 10G Network Traffic AnalyzerPalo Alto, CA, US, August 15, 2017 – Wasabi Networks today announced that they are adding 2 port 10G products to their Network Traffic Analysis range. The new 10G NTA20-4 is capable of full packet capture on 2 x 10Gb ports. The 10G NTA (Network Traffic Analyzer) product can capture, record and analyze network traffic at full line rate up to 20Gb/s. FOR IMMEDIATE RELEASE: 8/3/2017 Wasabi Networks Increases 1G Port Density in their Portable Network Traffic Analysis ProductPalo Alto, CA, US, August 3, 2017 – Wasabi Networks today announced that they are increasing the 1G port density of their Portable Network Traffic Analysis product. 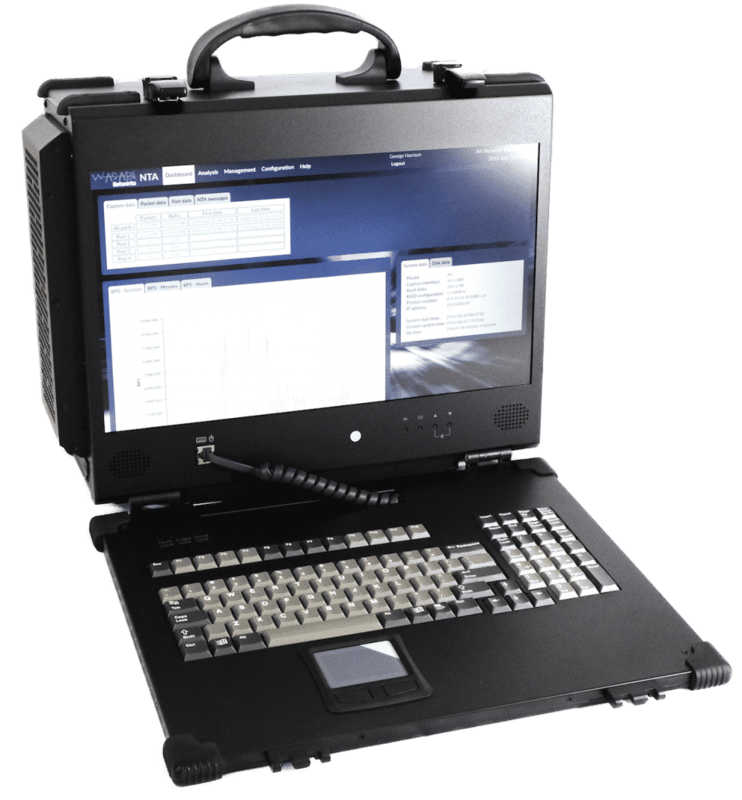 The new Portable NTA8-P is now capable of full packet capture on 8 x 1Gb ports. The Portable NTA (Network Traffic Analyzer) product can capture, record and analyze network traffic at 8Gb/s.